NumPy is not another programming language but a Python extension module. It provides fast and efficient operations on arrays of homogeneous data. NumPy extends python into a high-level language for manipulating numerical data, similiar to MATLAB. 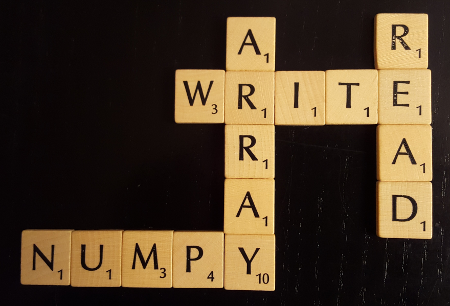 There are lots of ways for reading from file and writing to data files in numpy. We will discuss the different ways and corresponding functions in this chapter. The first two functions we will cover are savetxt and loadtxt. Attention: The above output has been created on the Linux command prompt! X array_like Data to be saved to a text file. a) a single specifier, "fmt='%.4e'", resulting in numbers formatted like "' (%s+%sj)' % (fmt, fmt)"
delimiter A string used for separating the columns. header A String that will be written at the beginning of the file. footer A String that will be written at the end of the file. comments A String that will be prepended to the 'header' and 'footer' strings, to mark them as comments. The hash tag '#' is used as the default. tofile is a function to write the content of an array to a file both in binary, which is the default, and text format. The data of the A ndarry is always written in 'C' order, regardless of the order of A. The data file written by this method can be reloaded with the function fromfile(). fid can be either an open file object, or a string containing a filename. sep The string 'sep' defines the separator between array items for text output. If it is empty (''), a binary file is written, equivalent to file.write(a.tostring()). format Format string for text file output. Each entry in the array is formatted to text by first converting it to the closest Python type, and then using 'format' % item. Information on endianness and precision is lost. Therefore it may not be a good idea to use the function to archive data or transport data between machines with different endianness. Some of these problems can be overcome by outputting the data as text files, at the expense of speed and file size. fromfile to read in data, which has been written with the tofile function. It's possible to read binary data, if the data type is known. It's also possible to parse simply formatted text files. The data from the file is turned into an array. file 'file' can be either a file object or the name of the file to read. dtype defines the data type of the array, which will be constructed from the file data. For binary files, it is used to determine the size and byte-order of the items in the file. count defines the number of items, which will be read. -1 means all items will be read. sep The string 'sep' defines the separator between the items, if the file is a text file. If it is empty (''), the file will be treated as a binary file. A space (" ") in a separator matches zero or more whitespace characters. A separator consisting solely of spaces has to match at least one whitespace. It can cause problems to use tofile and fromfile for data storage, because the binary files generated are not platform independent. There is no byte-order or data-type information saved by tofile. Data can be stored in the platform independent .npy format using save and load instead. There is yet another way to read tabular input from file to create arrays. As the name implies, the input file is supposed to be a text file. The text file can be in the form of an archive file as well. genfromtxt can process the archive formats gzip and bzip2. The type of the archive is determined by the extension of the file, i.e. '.gz' for gzip and bz2' for an bzip2. genfromtxt is slower than loadtxt, but it is capable of coping with missing data. It processes the file data in two passes. At first it converts the lines of the file into strings. Thereupon it converts the strings into the requested data type. loadtxt on the other hand works in one go, which is the reason, why it is faster.